Yes, don�t think it�s a problem at my end. I did think it might be congestion, but then I�ve done speed tests in the early hours and the problem is still there. Bit of a weird one. Have you tried downloading the test files from the TBB site? Download one of the large files and see if the download rate is consistent. I am 99.9% it is the Airties mesh system, on the 76 meg you see around 50 to 55 single thread and 38mbps 20 to 25. I would bet my life using your own router "resolved" it - although it is not really an issue. It's similar to QOS, the whole principle designed by airties is no one client can consume all the bandwidth thereby negatively impacting other users, with exceptions where it is entirely necessary eg a video stream at 35Mbps. The airties setup is not entirely disabled just because you have no sky tv. The more connected the more "managed" things become. Surely though that would be related to wireless throughput and not wired? It is managed based on the sync speed, AFAIK. You would not want one client to saturate the full line speed as that could impact the ability to stream on another client. Also, where you are fully saturating a line, it can impact pings for online gaming etc. Each client is managed in a way that it can do what it requires, without impacting other users too much. When I had Sky Q my single thread was capped, switching to my own router it was "normal." Call it what it is, a fancy QOS which manages everything. Well, that would stop me from going with Sky then. If it is going to throttle endpoints then I want the option to control it - I could sort of understand it on a wireless mesh but not on a wired connection. Agreed an on / off would be nice. Most users don't notice given the multi threaded isn't impacted. It's the typical for 95% of users vs 5%, for the 95% being able to download 4K movies on the sky box, game and stream all at once with minimal impact is a better experience than the sky download slowing everything down. The problem I had last night was some of my bandwidth was presumably being reserved for elsewhere and I didn't have enough for my PC. I was updating my sat nav (plugged into PC), which resulted in my hardly being able to browse the net. With pages taking 20 seconds to load. It's a weird system. Anyone know if there's a cooling off period for Sky Fibre and how long it is? If you saturate your connection then other bursty activity like web browsing is going to be impacted. Well maybe, except half my bandwidth appears to be being reserved on the off chance that another device might need it. If this was a standard feature of the Sky FTTC service it would show up clearly in one of monthly roundups, i.e. single thread speeds would be significantly different to the other providers. More investigation needed to say that Sky hardware is reserving bandwidth, QoS controls generally do not work like this, i.e. running QoS will reduce the top speeds a little but not by the margin you are seeing. Yes true and I imagine more people would be complaining on here or other forums. I�ll have to contact Sky I guess, but getting them to understand the problem, let alone do anything will prove difficult. Might just be less stress to cancel and go elsewhere. Looking online you have 30 days from your connection going live. That does sound more like congestion, or bad WiFi connectivity or a faulty router. The whole system is designed to avoid the issue just discussed. It used to be 8 days from install but last time I checked was start of the 2017. You don't get back any install fees AFAIK. Definitely not a WiFi problem, as that test and several others I've done are over Ethernet. I'd go with congestion as well, if not for the fact that the problem exists in the early hours. That leaves the router I guess. I'll give Sky a ring and see what they say. Maybe ask if they can supply one of the older Sky Hub 2 routers. They work fine on FTTC, mine holds sync fine at 80Mbit. The downside is that the wifi isn't as good as the Q router, but they do have 4 ethernet ports (albeit only 10/100 speed) and no built-in QoS. Just got off the phone to them before reading your message. They are sending a new Sky Q Hub to see if that fixes the problem. Thanks for the reply anyway. I've been doing a bit more testing myself. I turned WiFi off in the hub config pages so there was nothing connected to it except my PC over Ethernet. Problem was still there. So it's not like it's reserving bandwidth for other devices and causing issues that way. Fingers crossed it's just a dodgy hub and the replacement fixes it. Arrrrg! New hub, same problem. Just my PC connected. sending the same type of hardware was unlikely to solve the problem. I dont think its congestion. Flick through the router UI, if you see anything like QoS or deep packet inspection firewall, turn them off and try again. Hi Chrysalis, thanks for the reply. I'd already been through the settings to see if there was anything obvious that could be causing problems, but nothing I can see. Surely though, if it was a hub (settings) problem then this forum would be full of people complaining? 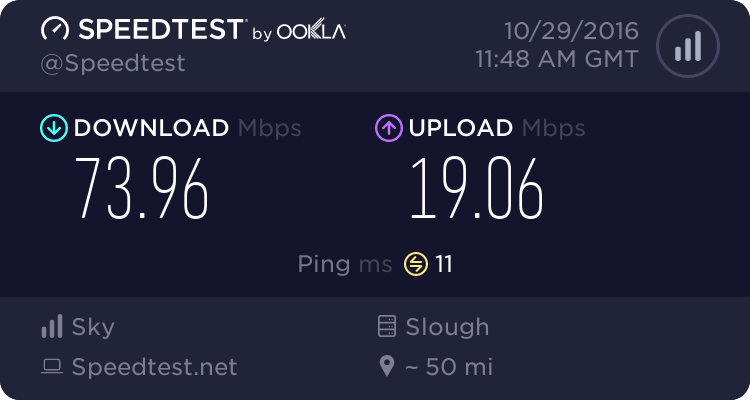 The Sky Q hub is still a relatively rare beast, but nothing in the speed test suggests a wide spread issue on this, unless other providers have similar issues. I had a quick browse on the Sky User Forum and can't see anything obvious on there and if it was a widespread issue with the router you would expect to see it there. I expect most of sky's userbase is not that internet literate, single threaded speeds in excess of 20mbit/sec is not going to break any mainstream services I am aware off and hence a lack of possible complaints. It could be a few things causing this but as usual trying to diagnose remote on a forum with no access to the equipment is very difficult. All we have to go on is this. It exists regardless of time of day. Swapping like for like hardware didnt work to fix it. If you have e.g. RWIN issues and your latency is higher on sky, then you could be RTT bottlenecked. Do you have a/v software active when running tests, there is things to try, just I am lacking motivation to go through all possibilities. Hi Chrysalis, Many thanks for the reply and suggestion about a/v. I only have windows defender and Malwarebytes on the machine. Disabling both didn't make any difference unfortunately. Latency is about the same. I just pinged bbc.co.uk and it was 21ms. Sky 4K on demand would work, if you analyse traffic flow the single thread speed increases where required for activities e.g. streaming. It is very noticeable on 4K / 8K YouTube video streams on the advanced stats, where the connection speed initially shows around 20Mbps and as the video plays suddenly it bounces right up every-time as the system kicks in. All I am able to comment is I had Sky at 2 different properties, in different areas, on different exchanges, on the Q hub my single thread behaved this way. On a netgear D6400 single thread was full speeds. There is talk of this on Sky Forums, not commonly covered but I have reviewed stuff there previously. On 80Mbps it is around 55 to 60Mbps single thread. It is by design and in reality has limited notable impact. I would argue it improves the overall experience for the majority where multiple activities can perform simultaneously with very little impact on one another. Hi ukhardy07, thanks for the reply. Just seems a strange system to me, because it means if I want to download a file, the max it runs at is 3MB (usually less), about 24Mb. I obviously want things to download as fast as possible. This even happens if there is only one device (my PC) connected to the hub. You don't happen to remember where to find the advanced stats you mentioned do you? Have looked in the hubs config pages (192.168.0.1) and can't see anything related to the speed of internet traffic. I think you'll find the advanced stats referred to are on the video streaming service rather than on the router (but I could be mistaken). Ah, thanks Ian, that would explain it. Well, the issue has now been passed to the Sky network team. Customer Service's thinking is it's a network problem after going through all the usual tests with me. I'll update here if there's any progress.